Pulav (Pulao of Pilaf) is a simpler version of the rich and flavorful Biryani. While Biryani is made by layering cooked rice with a thick meat sauce, Pulav is usually a one-pot meal where rice is cooked with all the other ingredients. 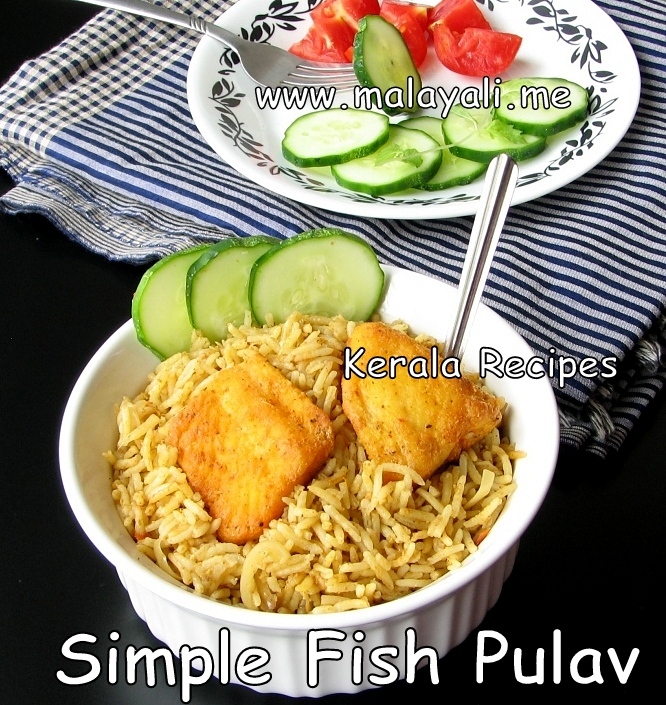 Here is the recipe for a simple Fish Pulav. Unlike Fish Biriyani, this Pulav is easy to make and isn’t rich with nuts, fried onions and other ingredients. While making Pulav, the rice is often cooked in broth for enhanced flavors. I have used Coconut Milk in this recipe, which is a typical South-Indian ingredient for Pulav. To prevent the fish from breaking, I lightly fried it before cooking it with Rice. I prefer Fish over Meat and love anything made with Fish. The combination of Coconut Milk and Lemon Juice imparts a decadent taste to this Pulav. 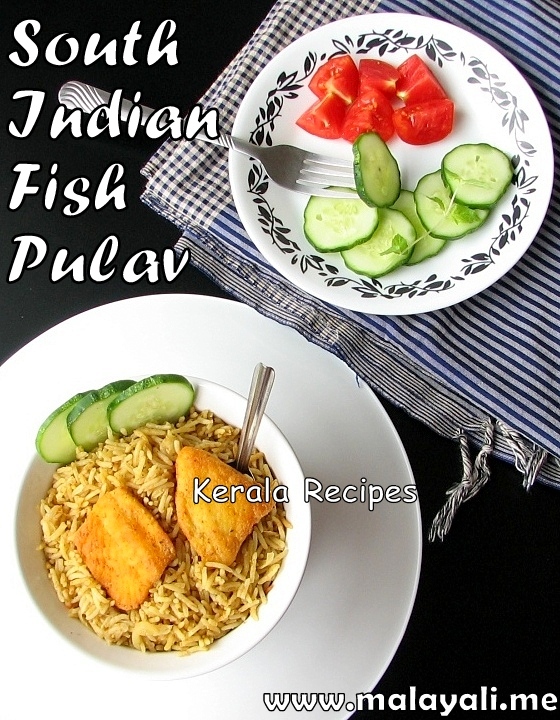 Enjoy this wonderful Pulav with Raitha and a simple Tomato-Cucumber Salad tossed in lemon juice. Wash the Basmathi rice thoroughly and soak it in water for 15-20 minutes. 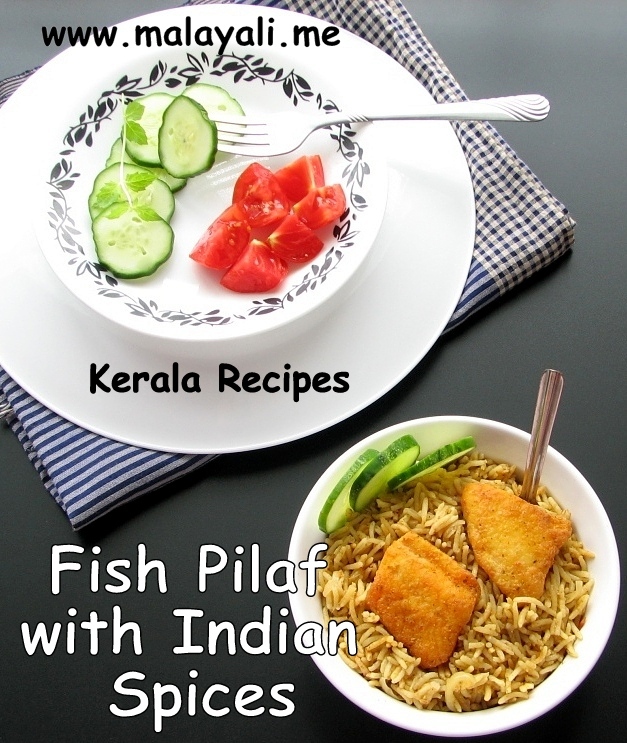 Clean the fish fillets and marinate it with the above ingredients. Keep it aside for 15 minutes. Meanwhile, dice the onions and tomatoes. Drain the rice and keep it aside. Grind the ginger, garlic and cilantro to form a smooth paste. Heat 2 tbsp oil in a deep nonstick pan and shallow fry the fish for around 3 minutes on each side. Remove onto a plate lined with paper towel. To the same pan, add 2 tsp of ghee. Throw in the sliced onions and saute till it begins to brown. Add the chopped tomatoes. Cover and cook stirring occasionally. Once the tomatoes are cooked, add the ginger-garlic-cilantro paste. Saute for 2 more minutes. Reduce heat and add turmeric, red chilly, coriander, meat masala and garam masala powders. Saute for a minute. Add the drained rice and fry for 4-5 minutes. Next, add 1 cup of coconut milk and 2.5 cups of water, followed by 2 tsp lemon juice. Add salt to taste. Place the fried fish in this gravy. Cover and cook the Pulav on medium heat for 7-8 minutes. Continue cooking the Pulav on very low heat for another 10-12 minutes until all water has been absorbed by the rice. Open the pan and gently fluff the rice with a fork. For 2 cups of rice, you will need 3 to 3.5 cups of liquid depending on the rice used and how long you soaked it. I have used 1 cup of Coconut Milk and around 2.5 cups of water. I tried this and my kids liked it a lot. Will be making this often. Thank You! The Fish Pulav which I made according to your recipe was superb.